“Pretty Little Liars” isn’t always an easy show to watch. With additional clues to digest each week and a new character/suspect introduced almost every episode, it sometimes feels like even the writers aren’t sure about A’s identity, or where the series is headed. Still, we tuned in to ABC Family every Monday (previously on Tuesdays) to watch the mystery unfold - hoping that by the season 2 finale we’d have some clarity, and that it would all be worth it. It wasn’t. After assuring fans that the show wouldn’t follow the book series, we can safely say the writers are a bunch of pretty little liars. Just like in Sara Shepard's novels, Hanna’s friend Mona turns out to be A. The former smart girl with no friends wanted revenge on the PLLs for stealing her friend Hanna. All along, Mona seemed like the obvious choice - with her extra cell phones and jittery demeanor. And if that’s not enough of a cop out, now there’s an "A team," which basically means everyone could also be A: Jenna, Garrett, Melissa, Lucas, Ezra and Caleb. Maybe even Paige, who distracted Emily at the masquerade party. We might as well throw Toby in there too, just for good measure. Despite a disappointing half-conclusion, the episode did have its moments. The “Psycho” shower scene had us on the edge of our seats, and Jenna’s cryptic exchange with a stranger in the park peaked our interest. A’s lair was even a high point, until Mona offered Spencer a stick of gum, commencing the most anti-climactic twist that’s graced primetime TV in some time. So what did you think of the season 2 finale? Were you pleased with the outcome? And more importantly, will you tune in for season 3 when it airs in June? Is the mysterious woman in red actually Alison? Was Alison’s twin sister Courtney pretending to be Ali all along? Was she the black swan at the masquerade ball? Web Hosting Linux memperbolehkan suatu perusahaan untuk membangun website mereka menggunakan sistem operasi dari Linux itu sendiri. Dengan menggunakan Linux di dalam pengembangan web maka akan memberikan fleksibilitas dalam menggunakan sistem operasi yang gratis seperti PHP, MYSql, Python, XML. Web Hosting Linux adalah variasi open source dari Sistem Operasi Unix. Okay, I'm sorry but guys, you commenters and the reviewer are being total know-it-alls without even being right. Did any of you tune in for the tag at the VERY end of the episode when Mona had a visitor. It wasn't her! She said to the person who is obviously A, "I did everything you asked." That means she was framed by A. So, pay closer attention. Also, why did the reviewer not even mention that in A's layer, the black swan dress drawing was in it, and the person wearing the black swan dress was most likely MELISSA, NOT MONA. Some of you are looking so deep that you miss the most obvious details. The creators kept their promise, because even though everything about the episode was true to the book, the very end tag suggested Mona is definitely insane, and maybe even somehow part of the A team, but she's not A. A team. "Team," get it? It's not just her, and maybe she got in on it towards the end and decided to take out her anger on Hanna by teaming up with A(s). Even if she is insane, she's not the only A, or maybe not even one of the A's. And, do you REALLY think A is one person, everywhere?! NO, Melissa(who could work with Jenna) most likely is responsible for all details said in Spencer's house, and since Hanna's phone had it on record every time she picked up, someone or even Caleb can hear all that she says. For Aria, it might be Ezra, and as for Emily, the only person she hung out with in her alone time was Maya, who's dead. So, as for Emily, it might just be connections with the girls, or just more Jenna. There are a lot of things left unanswered in this series, but that is the whole point of the show eh? Drama, suspense, action, romance. Well, here are a few clues that I have noticed in this show that come across very confusingly. 1. Obviously the girl in the red dress has an important roll in the plot. The fact that she first is shown when the focus is on Caleb and Hanna is a big notice that they are trying to make it unnoticeable,right? Everyone’s so focused is on them at first you don’t notice this, you think hey it’s just another dress. But as Mona is brought into focus you can obviously see the color contrast. Bright red on all dark colors! Plus the outragous mask! Also notice the time frame between them all too. The girls arrive, then Caleb, Mona, and the lady in “red” right after in under a minute and a half. The girl in the red dress brushed right by Mona. She also walks back through the frame when Mona was talking in the background although he mask looks black then. After Emily looks at the clock, it looked like her again in red although I am not positive. Then she is sitting in the background when Emily is talking to that girl. I actually forgot her name, but she seems really super suspisious. I swear I also saw her behind Emily but it was so dark I could not make out her face. 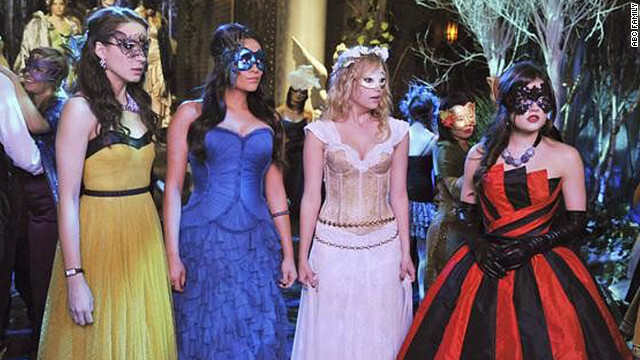 The black swan also passes by the lady in “red” when Aria,Emily,and Hanna are watching her. Red is a big part of this show. 2. Like I said red is a big part of this show, and obviously so is black. Now the black swan. I honestly think yes, she has a big part in the “A” team. She nodded to Jenna, and walked right by the lady in “red”, but I honestly think she was just a mire distraction to keep from all four of the girls going to the resort. They had to make someone “A” and little Mona wouldn’t have been able to take down all 4 of them. Plus, there is obviously another season, so they have to give a plot line to something. The can’t just say, “Oh, Mona’s A!” They needed a new fresh twist too start out on. Like why was a black swan contume in “A”s room at the resort????! 3. Mostly everything in this show is a symbolist clue, people just miss some of them. Vivian’s coat is red, so now red has became a big clue. I think Aria’s dress symbolises the lady in red and the fact that whoever Vivian is, she is a big part of Allison’s murder. 5. What is up with everyone making drop appearences?! Caleb shows up, with MONA’S help with a tux, when he is suppose to be in CA! Ezra, shows up when he is suppose to be at his moms and dads or away (forgot where he went)! Also forgot who said this but yes, no matter what if a formor teacher of mine showed up at a dance hugging and kissing all up on a JUNIOR and his ex student….SUSPISIOUS! Plus, he just lost his job days before, you don’t just lose a job at a college and your first thought “Oh now I can go date that girl I liked at that high school! Who was in fact still a junior… Don’t take me wrong here I love Aria & Ezra…Spens and Tobs are my fav thou <3. 6. Jenna is WACK! I mean who the hell fakes blind! She is def a part of "A" team. I find the whole "I've thought about this moment so many times..wondering what I would say to you if a saw you again…" Can I just say DOUBLE MEANING!!!! It was obviously have to be someone she knew before the fire incident. ALLISON!!??! Just to say this for the 20,0000,0000, time on these comments, "A" has most definatly NOT been figured out yet! Mona is a big decoy!!! Can I say, DUH! There are so many people that "A" could be there is no way they could have ended it. I don't care if they said, "A's revealed" I knew that it wouldn't be the end for the fact that there is still um lets see…Jenna, Lucas, Jason, Garret, Black Swan, Lady in Red, MELISSA….SO MANY SUSPISOUS PEOPLE!!!!! 8. Maya, I am really wondering if she is actually dead…They never showed her body… Idk if she really died and I am for sure super confused on her…Also, stealing Allison's body is really suspisious. "A" is obviously trying to hide something about Allison. 9. The car Emily thinks is the one from the grave digging night, does it or does it not look uncannily close to the same one Jenna drove to meet the mysterious stranger…. 10. Other little tid bit things my brain have questioned or thought of…. **What is up with the random guy in Brookhavens or whatever that swore to meetings with Vivian? Where in the heck did he come in at radomly? **What is up with that desterbed young boy that supposively "see's" things he shouldn't? He obviously knows things about 'Vivian' or 'Allison' and whatever it is that woman did not want him to be telling much of. **I agree weirdness is definietly in order for the random call from Dr.S to Toby. She also said Toby called her and she just happened to show up at the supposed end of "A"?? **Random thoughts on Ashley, Hanna's mom: I think a possible love intrest may be coming in for her. Hana drops a bunch of hints in the store about dating and being pregnant. **Random thoughts on the Britsh dude, Melissa's ex: I can also see him popping up as a complicating love intrest for Hanna, but is it also so completly normal that he ' just so happens' to "voluteer" in the same facility as Mona???!! – Hanna got hit by a car= hospital. Calab hacking "A"s phone=jail. – Spencer found out Jason is her brother!!! Toby was in the hospital too. – Emily was in the hospital. Maya is DEAD! Now besides the occasional normal teacher/student worries Aria & Ezra have not had ANYTHING bad happen to them! I think a major clue that Aria may be centered this time in the bathroom where she had a panic attack. We have already had Spenc, Emily, and Hanna all alone scrary dark places screaming for help…No Aria yet. I will be on the look out for a twist with them this season….Everything just seems to happy dory with them right now…And happy dory on this show screams SUSPISION! I actually liked this episode a lot and I really like Mona as 'A'. I started to suspect that it was her ever since the episode The Blonde Leading the Blind because that's when Noel breaks up with Mona and at the end we see 'A' cutting up pictures of Ezria and Spoby. It kind of makes sense (in a sort of psycho way) for Mona to break up Spoby and Ezria because she is upset about Noel breaking up with her. Anyway can't wait for next season. Hello there, You have done an incredible job. I will certainly digg it and individually recommend to my friends. I'm sure they'll be benefited from this web site. Well obviouisly Mona is not the only "A" because she says directly "I did everything you asked." to unknown person(s), and asked Specer to join the "A-Team" clearly implying mulitple people, my guess is Melissa, Garrett, Jason somehow, Jenna, and someone we don't expect, a parent maybe or Mike, Aria's brother, Caleb or even Maya. But I definately think that Ezra is not involved with A of the A team and I feel sure we will see more from the Hastings and Jason his summer. I love this show, but it was pretty predictable and I can't stand when they leave parts of the show unresolved! After watching this epsiode, I was pretty convinced that I wasn't going to watch the summer season but I soon realized that this episode left me with a lot of questions like: If the writers tell us the show won't be like the book, why make us think Mona is "A" if she is really just one of "A"s pawns? Is Allison still alive? Was she rteally talking to spencer and taking some of her pills and did she kiss Emily in the last season finale? If it's not Allison, are they going by the book and bringing in Courteney, Allsons twin? and if they are how are they going to explain that? I mean they already had Jason become Spencers brother. Lucas admitted to destroying Allisons memorium, so why was he standing next to Jenna and the black swan? Are they all "A"s pawns? Speaking of Jenna, how long has she not been blind? What does that fire at Jasons house have to do with anything? What did she give to "A" in the woods? Why is Toby back on her side? Speaking of Toby, why was Toby able to get in contact with Dr. Sullivan so quickly while it seemed like forever when Aria, Spencer, Emily, and Hanna to find her? The best part of this show was when Toby and Spencer got back together!! Loved it..!!! Maya...I just don't like her storyline. It seems to resemble Allisons storylline. First, she's missing and now she maybe dead. Sounds bad but I'm a little glad she is off the show! I'm hoping none of the girls are "A" but it would make SOME sense if Aria was "A". Think about it, in many episodes you hear one of the girls saying that Aria is a good liar. Aria was the last one with that red coat of Allisons and we see someone talking to Mona in a red coat at the very end of that episode, but I really don't want any of the girls to be "A" why would they torture themselves and their relationships. Overall, I can't wait for the summer season premiere. I for one enjoyed the season finale! Though a bit of it was predictable, I think its a great set up for the next season. It will be interesting to find out who the A-team is. "...Jenna’s cryptic exchange with a stranger in the park peaked our interest." No, it piqued your interest. I was very disappointed in the finale. Shocker that Mona hates the PLL for taking Hanna away. But last I checked, Mona and Hanna were friends. Also, I believe the Black Swan was Jenna. Look closely at the face and you will see it's her. And another comment made above, was that, how do we know Jenna was blind all along? She may have been faking it, even at the blind recovery center. Wasn't that in Phili where a lot of the mystery was taking place? Also, I think it's dumb that Lucas was in the finale after being gone for so long, as well as Dr. Sullivan. Dumb. And for a medical doctor to have to "go into hiding" because A was threatening her son, give me a break. Dumb. I'm really disappointed about the hype. I didn't expect a total "reveal" of A because then the show would be over, but this episode could've really been played anytime throughout the season. It was not finale-worthy in my opinion. I think the writers are really dragging this out just for money at this point. I'm losing interest and that's too bad. The show used to keep me on the edge of my seat and now I'm like "who cares" to this and "whatever" to that. Move it along or the show will be going off the air due to low ratings. And also, who gives a crap about Mya. She's a loser. And Emily's mom even said the cops "think" it's Mya. They don't even know for sure. I don't think Ezra is involved in anyway, or Paige. And whoever A is, doesn't mean he/she/they killed Allison either. It could just be a bunch of people out for revenge and they're calling themselves the A Team. Don't forget that Ian was a big part of this back in the day too. It's very possible he killed Allison. And this whole twin sister stuff, I didn't read the books, but I find that avenue interesting just because of the Halloween episode. Very disappointing episode! Probably won't watch another season they build it up lead you on say one thing and do another. Boring! We all knew Mona hated Alison ..no brainier there. A better ending would be if they actuall did reveal A. But they just revealed part of who A is. Boooo! 1) The mysterious woman in red is Allison. 2) Allison's mentally ill twin, Courtney, was pretending to be Allison all along. She's crazy for Christ's sake! 3) Maya is probably dead or she may have an evil twin....j/k. But who really cares? 4) Melissa may or may not be pregnant. That doesn't preclude them from using her to play the black swan. 5) The actress who plays Melissa was the black swan. Compare the swan's profile picture to Melissa's. Same nose, lips and chin. 6) Who cares about where Jason has been? Just another red herring. The real important question is: Have you lost interest in Pretty Little Liars? My answer is YES. They're obviously stringing this along to make as much money as possible from this, instead of putting the integrity of the show first. Should've revealed Allison as the red girl and then explain & wrap it up in Season 3. I'm disappointed that they didn't do something totally crazy in revealing A- like Ezra or something. Mona being A was predictable. The majority of us knew that that was what happened in the book, so even though we thought we knew they wouldn't have Mona be A again, it still wasn't cool or surprising. I wanted to be like WHA?! However, I liked the episode. Like this article says, I loved the creep factor. Seeing A's lair was so freaky in my opinion, right until we found out A was Mona. Then I was like, oh it's okay it's just Mona.. the girls are going to be fine. I wanted a scarier A! lol. I just hope they come up with some new ideas for season 3. This show is a mystery- it shouldn't be a rewrite of the novels- it takes out all of the fun. So who was blackmailing Alison as -A before she died then? Mona wouldnt have had the same motive to do that to Alison back then because she was not friends with Hannah until after Alison died.. I didnt want it to be like the books and im not crying about it but purely because of this I think the "black swan" and the person in the red coat at the end are the same person, i think they are the head of the "A team" and they have an agenda against Alison that has been hinted at but not stated at who they are yet.. If it is the twin thing it has been hinted at for example n the Halloween episode with the van from the asylem outside alisons house.. if the twin had "escaped" or something then that would have been the first night i nwhich Alison was attacked.. so confusing! Tay- Why do you think it's Hannah's Mom? I don't think mona is A. When she dressed up in that black hoodie, she was way too short. Think back to the season 2 winter premiere when Emily meets A. A is tall. Like the same height as spencer or a little taller than Emily. So, I'm still going to watch PLL even though mona is A or isn't. It just clicked into my brain, but not yesterday. She's probably part of the "A" team! So theres denfiniatly more than one A. She's probably the helper A. The main A or Alpha A as I call it, is the one that told Mona to sacrifice herself as A, leading the girls to believe that the mystery is solved. Overall, people should still watch for it. I denfiinity am. hey you guys forgot one important detail. jenna got her seeing back and do you guys actually know if jenna was blind at all. she could of been playing us this whole time. i dont think jenna is A because that would be way to obvious. i mean think about, why would they make jenna A when everyone thinks she is A. I wonder if they are following the book which i know for a matter of FACT they are not but pretend they are, why would alison take jennas place and if they are kinda following the book guess what the person they thought was alison was not, it was her sister courtney. The black swan was Ashley; Hannah's mom. I don't think she is the main 'A' but she is definitely involved. I still think Ezra is involved too. My mother also thinks it is one of the parents! She is a good choice because she has already manipulated the police on her own and she stole money from her job and did a pretty good job of hiding it and the whole thing with hefty hannah to keep A from revealing the truth could ahve been one of the other As (maybe Mona) adn that is why Mona had to be revealed? I was really disapointed by the finale. The writers said that they would not follow the book and they kinda of did.. So, for me, its spoiling the show. We will be able to predict it, if they keep on doing this. Since, there is an "Ateam " they could have revealed A and keep the story alive with the team members. I'll watch the beginning of Season 3 but if they pull another like that, I am out. Horrible. Disastrous. Steaming turd of an episode. Didn't like that Mona turned out crazy. She's not the only "A". I kept thinking it was Hannah's step sister. She had plastic surgery. So I was guessing that before the surgery she lived in Rosewood and Ali tormented her also. I do believe it's Mya's body. When Emily was getting those calls, emails and texts I immediately thought it was "A". So who came to visit Mona? The whole Motel Bates thing was a bit too much, but I still love the show. I do agree that I don't think Mona is the main A. This finale did leave me with a bunch of unanswered questions one of which is was Em really every texting and emailing with the real Maya all along? Maybe she never went to San Fran in the first place and A killed her. Em's mom did say they (being the cops) "think" it's Maya. If they aren't sure, then maybe the body had been there for sometime, but Em had just gotten a call from Maya a few hours prior that she wasn't able to receive due to the Liars being at that Lost Woods Hotel. In reference to the black swan, I was wondering if it was Alison's twin. I could see the twist in this show being that the A's (Jenna, Garret, Melissa, etc.) all being run by Alison's twin (dark haired one), her being the main A, being the one pulling the strings and being the one that killed Alison. Just my theories. I didn't read the books so I really don't know! Wasn't all that trilled with the finale, but I expected not to know the "true" A. And you also complain about not getting any clarity from the episode? Have you seen PLL before? After two years (46 episodes), you expected every question to be answered in an hour? You do realize it's a TV show, and there is going to be another season, right? Were you expecting another 20+ episode season about how much better life is now that the liars know who A is? That's not TV. Also, the actress who played Mona obviously knew she was A in the book but didn't know she was A in the show until a week before they started filming the finale. And would you have kept coming back each week if you knew from the pilot that it was going to end the same as the book? No. Nobody would have, and then it wouldn't be the most tweeted about show it is now. Plus, the series has been different from the books so try not to go around calling the writers "liars" just because your personal ill feelings toward the episode. I'm not even going to get too into you about Mona being a "cop out" and being upset about there being an "A team," because that is just dumb. No offense, but we've known there was a group of people for a loooooong time. How could there not be? Plus, we've seen them on tape IN Ali's room. Some people loved the episode. Some people hated it. But that just shows how amazing this series is, that so many people can have such strong feelings for these story lines and characters. I don't know about you, but the final minutes of the show took me on an emotional roller coaster ride, and at that point, I didn't even care who A was, how she was revealed or all the unanswered questions. I cared about theses characters that I've fallen in love with over the last two years. They sucked us in with the mystery of Ali's disappearance and A to keep us coming back every week, but then they made us fall in love with the characters and that's why I keep watching. this episode was amazing it had me questioning who A was even though i had a feeling mona had something to do with it. i have to admit i did cry though at the end when they found maya's body (then again we don't know if its her) but for the most part i loved this episode. Was I right or was I right? It's been obvious in the series that one person could not be A. My best guess- A is a group of people sometimes working together and sometimes not working together (at least Melissa, Garrett, Jenna, Lucas, and now we know Mona). One person has probably gone too far and is freaking out the rest of them. It looks like we'll be unraveling the mystery of who the A team is with every season finale. Some parts of the finale felt rushed but overall it was good. I agree that Dr. Sullivan suddenly reappearing was lame. The whole Mya death was way too rushed and didn't make sense. I'm staying tuned- despite the logical flaws in this episode, the overall pacing of the show is good and there's a lot of good chemistry between the characters. "A" has to be a group of people. Sometimes even in the dark wearing a hoodie, "A" seemed to be a guy. I don't see Mona pushing Ian over the railing or removing the body. Aria either. Garrett, Jason, Lucas, Noah or Aria's brother. But when "A" handed the store keeper an envelope full of cash, my thoughts jumped to one of the Hastings. Last night's episode left me with more questions than it did answers. Mona is not the only "A," in fact I don't believe she is the main "A." I think who ever the main A is has been forcing everyone else to play along side the "A-Team." I would have guessed Mona to be part of it though but the writers completely threw me off when they said they were not following the books. The episode was the scariest one yet though.... Mona looked freaky dressed in the black hoodie with her face exposed. I wonder who the black swan was at the ball? A lot of people say Mr. Fitz' ex, Jackie, but idk.... she hasn't been in too many episodes so it would seem rather odd to have her be part of the "A-team." The only reason why I think people believe it to be Jackie is because of the body type... Melissa has the baby bump so how would she hide that in that outfit? Now that the show is sort of going alone with the books I wonder if Ali and Courtney will play a role?... One things for sure I'll never trust what the writers say again. lol We don't know if the body found is Mya's, Emily's Mom said they think it might be.... It's just odd how Mya and Emily were on the phone one min and the next her body is found? People actually think Aria is A.... But I'm kind of hoping none of the girls are A.... It would just change the entire dynamic of the show. Just because someone was controlling Mona doesn't mean shes not the only A, it just means shes answering to someone else. And maya never contacted Emily, that was A messing with her. And just because the same person from the books is A doesnt mean thatthe whole thing plays out the same. Like her motives and how she did it could end up being TOTALLY different. I for one LOVED the finale, I mean theycanty solve everything now, its only the seasoin finale not series finale!!! Sorry, the one who likes to lick balls (especially babies... ewww) is the one referring to himself as @NKBL & Observer. Observer is my daddy. Daddy likes to lick my balls. Daddy is a conservative perv.